Ever since I made my five greens pasta last week I have become mildly obsessed with greens and my fridge is bursting at the seams with them. 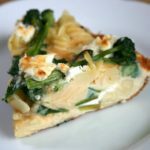 My submission this week is a frittata; using pasta in place of the more traditional potatoes, with purple sprouting broccoli, spring greens and soft goat’s cheese. I used fusilli in my frittata. Liking alliteration I really wanted to make the Fuss Free Flavour’s Fusilli & Farfalle Frittata, which I imagine would be interesting to try and say after a few glasses of wine! The amounts are a guideline only – just use whatever ingredients you have; my 6 egg mix filled my 8″ frying pan. Remember to use a pan with a heat proof handle as it will be going under the grill. This was delicious freshly cooked and warm, but unlike a potato based frittata not so good cold the next day. If you try this Greens, Goat’s Cheese and Pasta Frittata please tag #FussFreeFlavours on Instagram or Twitter. It is amazing for me when for me when you make one of my recipes and I really do love to see them. You can also share it on my Facebook page. Please pin this recipe to Pinterest too! Thanks for reading Fuss Free Flavours! A hearty and filling dish; makes for a perfect lunch. Put the pasta on to cook. Meanwhile prepare the greens by shredding the leaves and cutting the broccoli stalks lengthwise. Place in a colander and rinse, then wilt by pouring a kettle of boiling water over them. Crack the eggs into a bowl and lightly whisk, add pepper and salt to taste. When the pasta is cooked drain, cool by rinsing in water, return to the saucepan and add a little oil and stir well (this prevents it sticking together). Add the pasta, greens (reserving some broccoli stalks), 2/3 of the cheese to the eggs and stir well. Warm a frying pan, add a glug of olive oil, pour in the egg mixture and cook slowly over a low heat without stirring. Arrange the remaining broccoli and goat's cheese on top of the egg mix. Leave to cook for about 5 to 10 minutes until the eggs start to solidify. Finish cooking under the grill. When cooked the fritatta will have puffed up and have started to brown. Leave to set for a few minutes and then carefully slide onto a plate. Serve warm.